On Friday evening, we were on our way for tacos, when all hell broke loose in the car. It was 5:30 pm. My 7-year-old son had just finished an intense 90-minute soccer practice. During this time his sister had been kicking the ball around with a few teammates. It was the end of another 90 degree day. Both kids were hot, sweaty, and my son’s knees were black from turf dirt. They were hungry. They were tired. It was no surprise what happened next: yelling, fighting, tears, complete and utter irrationality. Normally, this is not the state in which I take kids out to eat. In fact, taking tired, hungry, cranky kids out goes against everything I’ve ever written here about kids and restaurants, summed up here. But let me back up. The kids are growing like weeds. These days Finn reminds me of a baby giraffe. He’s all lanky arms and spiking legs and careens around on his bike, or skates, or on the field in a headlong way, as if shot from a catapult, always on the verge of falling. Ella is an athlete. She spends long, intense hours at the soccer field and in the pool. To see her in her soccer gear or swimsuit is to see a girl totally at home in her body and its strength. It’s awesome, and we tell her this every day. It’s become clear to her father and me that her body craves this kind of physical outlet just as much as her mind craves the novels she schemes to stay up too late reading. Even Finn, whose sports are less serious will gear up for roller hockey and skate in the car port on days we’re at home. All this means one thing: they need more food. A lot more food. A few weeks ago we made the direct link between between the kids’ moods and their blood sugar levels. There are distinct danger times: right after school, right before lunch, right before dinner. Snacks have become urgent, no-compromise affairs. I’ve been tempted to show up at school with those little glucose packs cyclists carry. Instead, I’ve become an efficiency expert, whipping up smoothies with milk and fresh fruit or peanut butter, slicing cheese, cutting fruit, freezing yogurt, rolling salami, pouring milk, handing over crackers, defrosting edamame, portioning nuts. Protein has become essential for both of them, pre- and post- practice, and calcium is especially important for Ella in these pre-adolescent years–as it is for all girl athletes. So that night on the way to tacos (or not) I had two choices: take them home and find something to cook, or soldier on and hope for the best. The first option was not so appealing to any of us. My kitchen was clean. I had nothing prepped. We love tacos. What they needed was food. Fast. So against my better instincts, I drove straight past our house and up the hill to the taqueria, all the while scheming about what healthy, sustaining thing I could get into them fast. Because it was hot, and perhaps because the taste of fresh lime and seafood is still lingering from our San Diego extravaganza, my food brain conjured one word : ceviche. Before we entered, tears were dry, kids were calm, and they had been read the riot act in my scariest mom voice. 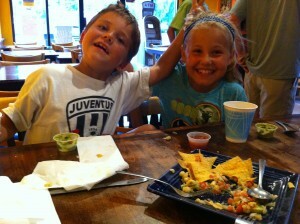 Inside, they commandeered the table where they could watch the MLS game (another benefit of taco night out). I stood in line. ordered for all of us, and asked for the ceviche to be brought right away. I had no reason to think they would love it. But I also had no reason to think they wouldn’t. It was cool and fresh and full of citrus and tender white fish. I knew it wouldn’t completely stuff them before their dinners, and I knew it would complement whatever they ended up ordering. I also told them they had no choice in the matter, and so two minutes later, while we waited for carne asada, and tacos al pastor, and a quesadilla, the kids confronted a gorgeous pile of white fish ceviche with fresh avocado and a mountain of fresh chips. Finn dug in first, and then there was no turning back. Not for him, not for Ella, and not for the mood of the night. As quick as they could load a chip, the mood of the night turned. They polished off the ceviche until only scraps of fish were left. Dinner came and they didn’t stop eating. We went home happy and ate ice cream. The lesson here? Food is fuel. If you’re lucky, sometimes it’s more. « Warm Escarole Salad with Apples and Nuts (Success!) » The Quarter-Acre Farm: book giveaway!